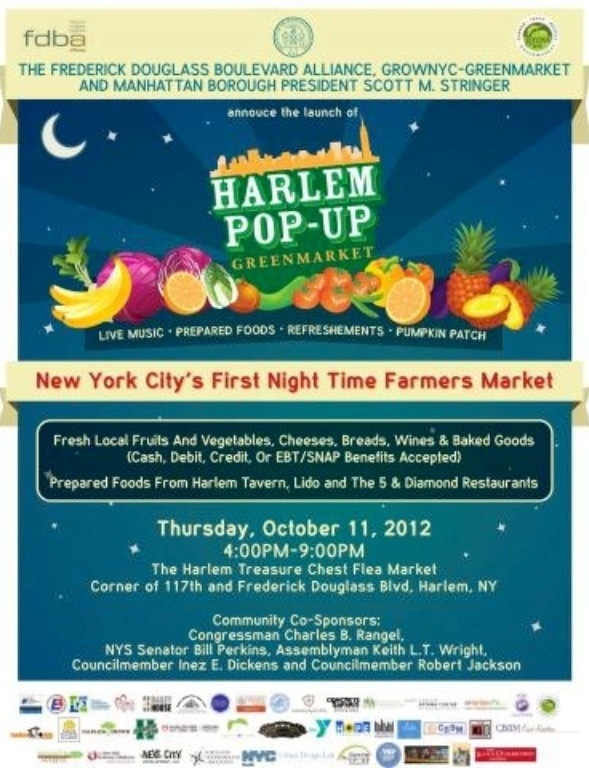 Attend Harlem Pop-up Green Market October 11 in Harlem | HarlemGal Inc.
More information has come in regarding the pop-up farmers market planned for October 11 at The Harlem Treasure Chest. According to a flier, this event is being organized by the Frederick Douglass Boulevard Alliance, Grow NYC Green Market and Manhattan Borough President Scott Stringer. It starts at 4 pm and ends at 9 pm on the corner of 117th Street and FDB. Prepared food will be provided by 5 and Diamond Harlem, Lido Harlem and Harlem Tavern. For additional details, see flier below. This entry was posted in 5 and Diamond Harlem, Community, Events, food, Frederick Douglass Blvd., Harlem, Harlem Tavern, health and wellness, Lido Italian Restaurant and Bar, music, New York, New York City, NYC, restaurant row, restaurants, shopping and tagged 5 and Diamond Harlem, farmers market, Frederick Douglass Boulevard Alliance, Harlem, Harlem Tavern, Harlem Treasure Chest, Lido Italian Restaurant and Bar, Manhattan Borough President Scott Stringer, Organic produce. Bookmark the permalink. A nighttime farmer’s market. What a great idea! And they mentioned my favorite word…food. Yes, love the concept too. Looking forward to it!